You’ll notice that most of the players in that graphic, many of whom have had successful and lucrative NBA careers, played basketball at UConn. What the hell does the professional success of basketball players who did not go to school at Rutgers have to do with Rutgers? The basketball program just hired Karl Hobbs, who spent many years as an assistant at UConn, to be its associate head coach. So there you have it. 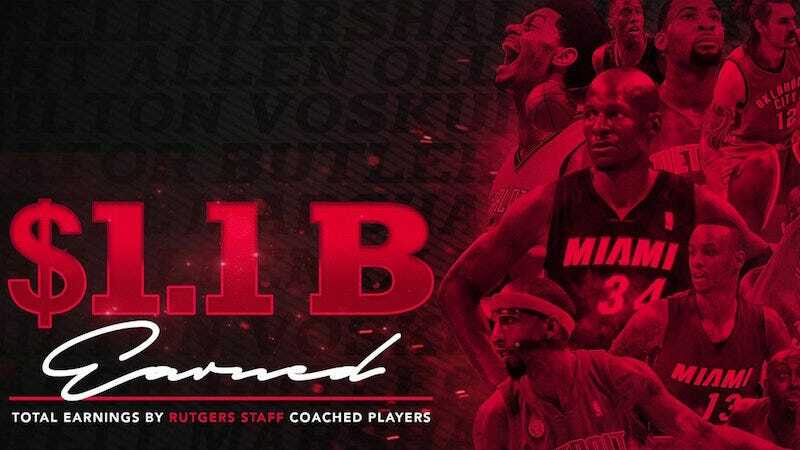 If you’re a standout high school basketball player, consider enrolling at Rutgers, where an assistant coach who used to be an assistant coach at UConn will surely put you on the path to NBA superstardom.